The Total Wellness Cleanse was created by Yuri Elkaim, Holistic Nutritionist, Certified Kinesiologist, honors graduate in physical education and health, and a former professional soccer player. Elkaim says, “if you feel sluggish, overweight, tired, and lacking in energy, then your body has probably been overwhelmed by environmental toxins, household chemicals, food preservatives, and processed ingredients.” His 30-day cleansing program is designed to help you to rapidly cleanse your body of these toxic chemicals with a simple plan that doesn’t require the use of expensive detox supplements. Alkalize the body: When you reduce the level of acidic wastes in your blood, your energy and health will dramatically transform. Get sugars out of the diet: Eliminating sugars reduces acidity and assists with addressing parasites and candida. Repair and support vital tissues and purify the blood: The health of the liver, stomach and small intestines should noticeably improve. Initially you will undertake the 14-day cleanse phase, which emphasizes increasing the intake of alkaline foods, removing acid-forming and allergenic foods, reducing the level of toxins and restoring proper function to your vital organs. During this phase you will experience a reduction in sugar cravings and an increase in your energy level. Following this you will move into the maintenance phase, lasting for two weeks, where you start to implement a personalized cleanse diet and lifestyle plan. The final phase involves an 8-week post cleanse meal plan that will help you transition back into the “real world”. There are three levels in the Total Wellness Cleanse Diet and you are encouraged to choose the one that best suits your needs. Level 1 is a standard whole food diet, level 2 is a raw food diet and level 3 is a green juice feast. You can switch between the different levels during the program, which allows you greater flexibility. For all three levels there is an emphasis on increasing the intake of green vegetables as juice, green smoothies and salads. Most fruits should be avoided during the cleanse phase, however apples, pears and berries can be consumed in moderation. Vegetable juice, raw and cooked vegetables, berries, apples, sprouts, avocado, quinoa, brown rice, millet, buckwheat, almonds, sunflower seeds, walnuts, sesame seeds, chick peas, black beans, lentils, olive oil, flaxseed oil, coconut oil, apple cider vinegar, tamari, miso, herbs and spices, stevia. The Total Wellness Cleanse Diet exercise is regarded as a vital component to not only cleansing your body but for improving your overall health and fitness. Dieters are encouraged to exercise for 20-30 minutes, three times a day. Activities such as walking, yoga, strength training and deep breathing are recommended. The Total Wellness Cleanse diet is available for download for a cost of $247 or three payments of $79. Assists with the elimination of toxins. Reduces cravings for unhealthy foods, especially sugar. Includes a 14-day meal planner and recipes. Includes a post-cleanse 8-week meal plan with recipes. Includes 13 hours of educational teleseminars. 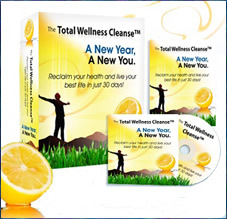 Total Wellness Cleanse comes with a 60-day money-back guarantee. Emphasizes the value of a positive attitude. Will require a complete overhaul of the eating pattern of most dieters. Necessary to prepare your own meals for the entire 30-day Wellness Cleanse Diet. Many of the recipes involve the use of a juicer. Expensive in comparison to many other diet programs. Many dieters will experience detox symptoms such as headaches and fatigue. May be difficult for many dieters to find the time to exercise three times a day. The Total Wellness Cleanse Diet is a 30-day program designed to alkalize the body and assist with the elimination of toxins so as to enhance weight loss and improve general wellbeing. It is a very strict program that requires quite a high degree of commitment, however this approach is likely to produce positive results in a short amount of time, especially for dieters with chronic health problems who have not achieved success on conventional diet plans.